I bought this at a second-hand book shop because I thought it sounded like fun. 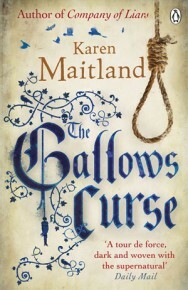 The Gallows Curse is a story of witchcraft, murder, guilt and betrayal. It has wise women, a dwarf madam and a talking mandrake. Yes! A good read, especially if you like a juicy mystery and don’t mind a bit of implied violence. Not strictly a paranormal – it’s called a ‘mediaeval thriller’, or ‘historical mystery’ But it’s set in a world – the 13th century – where people didn’t just believe in witchcraft and miracles and the fires of hell. They knew those things were real. So it kind of is a paranormal world, where supernatural explanations for things are as readily imagined and accepted as the natural. It interests me, because it seems – reference Suzanne’s Paranormal is Dead post from last week – that this is how we now get paranormal onto the shelves: we dress it up as something else. We write fairies in modern day New York and call it ‘magical realism’. We write satanic disappearing film makers and covens of weirdos and psychotic wives who fake their own disappearances and call them ‘thrillers’ or ‘dark mysteries’. We write a vampire or angel or demon story, even a paranormal romance, but we make it 150,000 words, put a literary cover on it, and who’ll know? We’ll get it on Oprah or Richard & Judy in no time flat. We write magic and vampires in Victorian London and say ‘what do you mean, this is paranormal?! ?’ No, not at all. It’s steampunk with a twist. It’s alternate history with magical realism dark mystery elements and a clockwork partridge in a genetically engineered aether-powered pear tree, because paranormal is dead, doncha know? Wouldn’t be caught dead writing that. Cool. Glad we agree on that. I’ll just go watch Game of Thrones and Guardians of the Galaxy, which both just made more money than God. Sure, no one wants fantasy and romance in the same room any more. Right Whatever you say. We still get it in by the back door. Because we’re sneaky like that. Tags: erica hayes, fantasy, mediaeval, witchcraft. Bookmark the permalink. It really does sound like a fun read. And I still don’t believe that paranormal romance is dead, it is my favourite genre and I keep buying books in this genre, and discover more new to me authors to follow. Good to hear 🙂 me too!